So, you’re planning a trip to Key West? 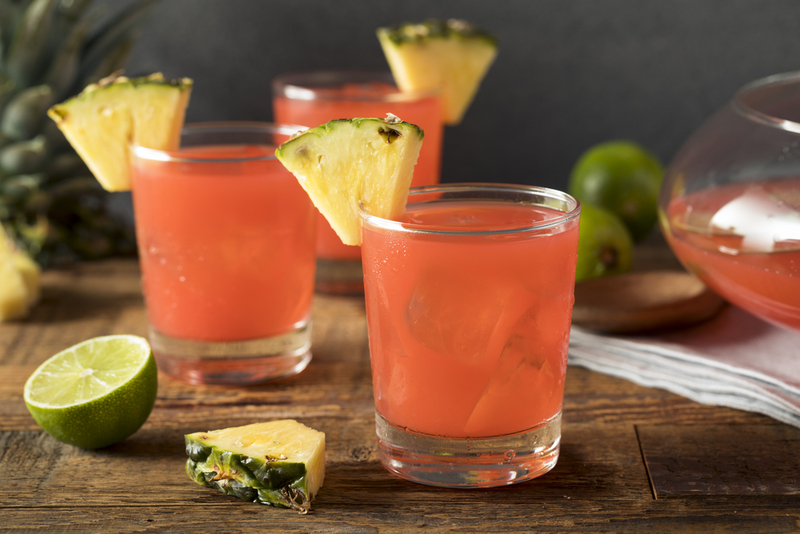 Let’s talk all about rum runners. During Prohibition back in the 1920s and ’30s, bootleggers illegally imported rum from Bimini, Cuba and the Western Bahamas to speakeasies across Florida. Key West, located at the southern end of the U.S., close to Cuban rum and easily accessible by boat, never took Prohibition as serious as a good drink. “Sloppy” Joe Russell, boat captain, rum runner and a good friend of Ernest Hemingway, officially opened his bar the day that Prohibition was repealed. This was obviously a formality, as Sloppy Joe was already an active rum smuggler. Hemingway, no stranger to booze or gritty island life, later wrote a book on the subject of the black market that existed between Cuba and the small island. He modeled characters after real island personalities in his book “To Have and Have Not,” including barkeep and owner “Sloppy” Joe Russell. And the rum runner cocktail? Legend has it that in the 1950s, the Holiday Isle Tiki Bar was overstocked with rum and other liquor, so a bartender invented a drink to help ease up shelf space. He mixed white rum, dark rum, pineapple and orange juice, banana and blackberry liqueur and a splash of grenadine to create the rum runner. Rum runners and bootleggers are part of Key West history, so it’s only appropriate that you order a totally legal rum runner on the island. Here’s a few places to get the best rum runner on the island. And be careful! These drinks go down easy and catch up to you quickly. Have you had your Cuban food fix? This family-owned and operated restaurant has been serving Cuban fare in Key West for 30 years, and their cocktail menu is no exception. They use the smooth Flor de Caña rum to make for a tasty rum runner. This 72-square foot watering hole lives up to its name. Surprisingly, some say they have the best rum runners on the island. Order at the tiny bar and enjoy your rum runner outside and enjoy the view -- there’s almost always something to see. Part of the Duval crawl, the rum runner at Hog’s Breath has rave reviews. The atmosphere is definitely dive bar with a full menu and live music. Also, if you’re interested in checking out the rum scene in Key West, check out the Key West First Legal Rum Distillery located right near Mallory Square. They’re open daily with free tours Monday through Saturday, and offer Mojito classes weekly. More info here.